Ray’s endorsement of Roy’s introduction of ‘realism’ to mainstream Indian cinema seems to suggest that much of the cinema before had been bereft of such a vital aesthetic quality but of course this is simply not the case. However, Bimal Roy’s approach to cinema extenuated the realism aesthetic that had evolved out of the post war Italian neo realism movement. Similarly, Roy was deeply moved by how film makers like De Sica and Rossellini had effectively rewritten the rules of cinema but the shattering realisation was that such an ideological breakthrough had occurred within the parameters of the mainstream. Roy understood how De Sica had made the seemingly impossible marriage of art and commerce a daring reality in the face of a bankrupt Italian society, and he had done so on his own personal terms. It is difficult to discuss films like ‘Do Bigha Zamin’ without making reference to the Indian people’s theatre Association (IPTA) and acknowledging the debt Indian cinema owes to such an influential organisation. Formed in 1942 as a response to the social crisis brought on by the Quit India movement, the IPTA’s primary objective was to use theatre as means of addressing the many problems taking hold of society. Many of its initial members unashamedly declared their staunchly anti colonial views and espoused a Marxist point of view that argued for a cinema based on socialist principles. K A Abbas, Prithviraj Kapoor, Balraj Sahni, Ritwik Ghatak and Salil Chowdury were just a few of the members of the IPTA who would later become influential figures in their own right, reiterating the ideological imperative of cinema acting as voice for social change. The partition of India in 1947 and the creation of Pakistan shattered the IPTA’s desire to bridge the differences between Hindus and Muslims in cities like Bombay, resulting in communal rioting and the establishment of deep sectarian divisions that exist even today. The IPTA had received much criticism at the time from conservative sections of society, accusing the organisation and its liberally inclined members of being effectively an offshoot for Marxist propaganda who harboured unrealistic dreams of turning the Indian peasants into organising a widespread socialist revolution. In terms of pioneers who paved the way for a new kind of cinema in India, the figure of Khawja Ahmad Abbas (K A Abbas) proved to be crucial in realising the possibilities of a similarly inspired movement to that of neo realism in Italy. 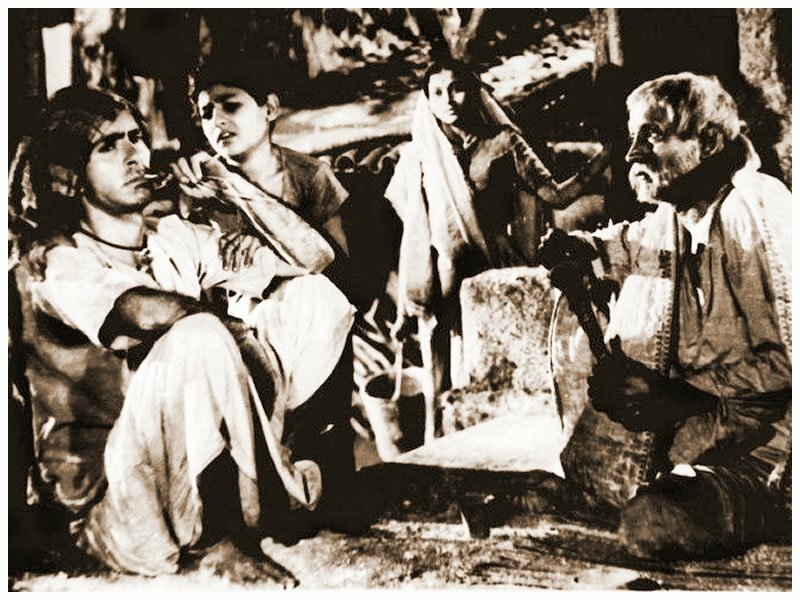 Released in 1946, ‘Dharti Ke Lal’ (Sons of the Earth), is generally considered to be the first mainstream Indian film to have outlined the notion that cinema could act as didactic force in the lives of audiences. Surprisingly, even though ‘Bicycle Thieves’ is regularly cited as a key influence in the aesthetic and ideological choices taken by Bimal Roy when directing ‘Do Bigha Zamin’, it had yet to be released when K A Abbas embarked on ‘Dharti Ke Lal’, which perhaps suggests that the neo realism movement in India was running parallel with that of Italy. If this is true then maybe the emergence of socialist political organisations and theoretical Marxist writings after the Second World War was a universal phenomenon experienced by the intellectual circles of many cities. Many of today’s Indian actors seem reluctant to get into any kind of debate concerning personal political beliefs as it may affect potential box office, but those who are able to do so are usually the ones with the capacity to articulate their concerns and use cinema as a platform for propagating leftist ideology. Balraj Sahni was a prominent member of the IPTA and an outspoken Marxist who starred in many neo realist films that challenged the constraints of studio film making in which melodramatic elements were regularly given precedence over other ideological and aesthetic concerns. Sahni was a widely respected figure within the film industry and remained politically active throughout his career. In today’s terms, Sahni would be considered somewhat of a method actor and many of his memorable performances in films like ‘Do Bigha Zamin’ and ‘Kabuliawala’ demonstrate a physicality that is strikingly authentic. In preparation for the role of ‘Sambhu Mahato’, Sahni spent time with rickshaw pullers in the city, immersing himself in the social milieu of his impoverished character and underlining his consummate and realist approach to performance. Though Sahni may have been politically active, he was also deeply affected by the partition of India and the devastating loss of life. Unlike his contemporaries, Sahni was very selective in the films he choose to star in and though this may have prevented him from achieving widespread recognition as a powerful Indian film star, his body of work expressed a consistency in terms of cinema that was aligned to his own political and social commitments. It is a shame that Sahni is better remembered by today’s generation for his patriarchal role in Yash Chopra’s 1965 ‘lost and found’ multi-starrer, ‘Waqt’. The death of his daughter at an early age seemed to have an impact on him personally and his visit to Pakistan after the trauma of partition was exorcised in a book. His literary talents were shared much more emphatically by his brother, Bhisham Sahni, who was one of India’s most respected writers and whose novel, ‘Tamas’ (Darkness), would later be adapted as a screenplay for a much acclaimed and controversial TV series on the partition. The closer you scrutinise the many different new waves or movements that have emerged since Italian neo realism and it becomes starkly apparent how films like ‘Bicycle Thieves’, ‘Umberto D’ and ‘Paisan’ continue to be influential in terms of what it actually means to capture and observe reality with an honesty, authenticity and truthfulness. Examine any sequence from ‘Umberto D’ and it is difficult not to notice how De Sica’s treatment of the aging professor edges close to becoming purely sentimental. Many of the Iranian new wave film makers like Abbas Kiarostami, Jafar Panahi and Darius Mehrjui were also indebted to the traditions of neo realism but unlike De Sica’s dependency on music as tool for manipulating the emotions of the spectator, Iranian cinema rejected such artifice in favour of purifying cinema and pushing the ideas of Zavattini as far they would go. Though Bimal Roy embraced the aesthetics and ideological principles of neo realism, he was constrained by the reality of having to work within a set of limitations as ‘Do Bigha Zamin’ for all it’s socialist ideals was nevertheless a studio film. Working within the conventions of social/family melodrama genre, Bimal Roy integrated songs into the narrative which in the eyes of purists went against the stylisation and escapist nature of what neo realism was trying to oppose. However, apart from this musical compromise, ‘Do Bigha Zamin’ is closer to the work of De Sica then it is to many other neo realism films, especially when you compare the humanist depiction of the relationship between Father/Sambhu and Son/Kanhaiya. The parallels are striking when compared to ‘Bicycle Thieves’, most significantly perhaps in the idea of the son having to work tirelessly so that he can support his father’s desire to reclaim the ancestral land which rightfully belongs to him. Also consider how cynically the film represents the city; like ‘Bicycle Thieves’, the city is depicted as a labyrinth that literally consumes Sambhu’s aspirations and subsequently corrupts his courageous but illiterate wife, Parvati. Contrast that with the almost lyrical and perhaps over idealistic picture of rural village life and it is plainly obvious that Bimal Roy seems to condemning the speed of modernisation and urban life as something out of control, ravaging those who simply cannot keep up with the pace. The denial of any kind of satisfying resolution to the poverty of Sambhu is also what makes ‘Do Bigha Zamin’ such a powerful film. Not many Indian films aimed at a mainstream audience had at the time dared to defy the expectations of audiences who had become accustomed to the familiarity of the melodrama, but the film’s downbeat ending in which we see Sambhu, his wife and son looking out, despairingly at the overwhelming image of a factory being built on the land that has effectively been stolen from them is a moving confirmation of Bimal Roy’s success in being able to integrate neo realist influences with the traditional trappings of the Hindi melodrama. Ideologically, the pessimistic ending illustrates that social oppression is something monolithic, inevitable and a hegemonic extension of industrial change and capitalist triumph. This entry was posted on October 15, 2014 by Omar Ahmed in Hindi Cinema, Indian CInema and tagged Balraj Sahni, Bimal Roy, Indian Cinema, Neorealism, Political Cinema.